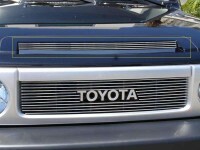 21933: 07-14 Toyota FJ Cruiser Hood Scoop Polished Billet Grille. Comes with hardware and instructions. Installation time is about 1/2hr. Backed by manufacturers one year warranty Made in USA. Tell your friends about the Hood Scoop Billet Grille. Share this product on Facebook, Twitter, MySpace or send an email to a friend!